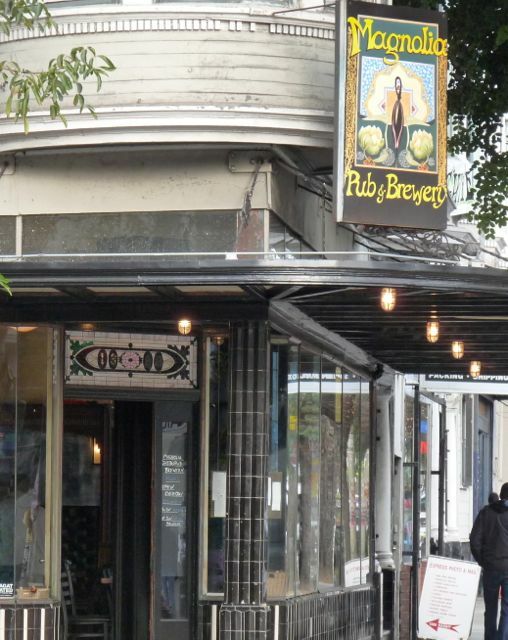 Magnolia Brewpub is located in the heart of the Haight-Ashbury District. They manage to cram a lot of people eating good food and drinking great beer into a small historic storefront. They have 15 taps, 5 of which pull cask conditioned ales from the cask cellar through five traditional British beer engines. They make a few fine standards and rotate many other original brews through the year. Extras: This is a popular, elegant pub that aspires to serve excellent food. Beautiful Golden Gate Park is a mere 5 blocks west, so you may enjoy the park then end up here. Also, Magnolia’s owner opened Alembic, 3 blocks west on Haight St., which specializes in high-end spirits and carries some Magnolia beers, too. From the east, go to Civic Center BART, exit on the north side of Market St. Take MUNI bus #6, 7, or 71 which go up Market and turn on Haight Street. (Bus fare is $1.50 exact change. Dollar bills are allowed.) Get off at Masonic Street. Magnolia is on the northeast corner. From the south, go to 16th St BART, exit on the east side of Mission St. Take the 22 Fillmore bus from the northeast corner of 16th and Mission (remember to ask for a transfer). Get off at Haight Street and either walk uphill 8 blocks or use the transfer to take any bus that comes your way.